Once upon a time, there were three little pigs who wanted to live in a grassland, but first they needed to build their houses. Down the road from the three little pigs lived a big bad toad who enjoyed eating little pigs more than she enjoyed having them as neighbors in the grassland. The first little pig built his house of plasma. Along came the big bad toad, and she said, "Little Pig, Little Pig, let me come in!" The first little pig replied, "Not by the hair of my leg! 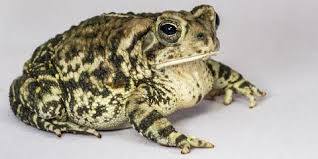 Then the toad said, "Then I'll digest and I'll sneeze and I'll blow your house in." And the big bad toad digested and she sneezed, and she blew the first little pig's house in. The second little pig built his house of old rags. The second little pig replied, "Not by the hair of my eye! Then the toad said, "Then I'll sniff and I'll tread water and I'll blow your house in." And the big bad toad sniffed and she treaded water, and she blew the second little pig's house in. The third little pig built his house of taffeta. 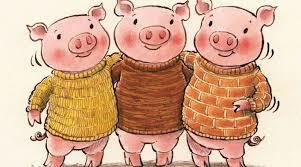 The third little pig replied, "Not by the hair of my front tooth! Then the toad said, "Then I'll exercise and I'll hang around and I'll blow your house in." But no matter how much the big bad toad exercised and hung around, she couldn't blow in a house made of taffeta. The big bad toad felt taciturn. "Holy Minerva," she said, and went away defiantly. From that day on, the desperate pigs never saw the big bad toad again.